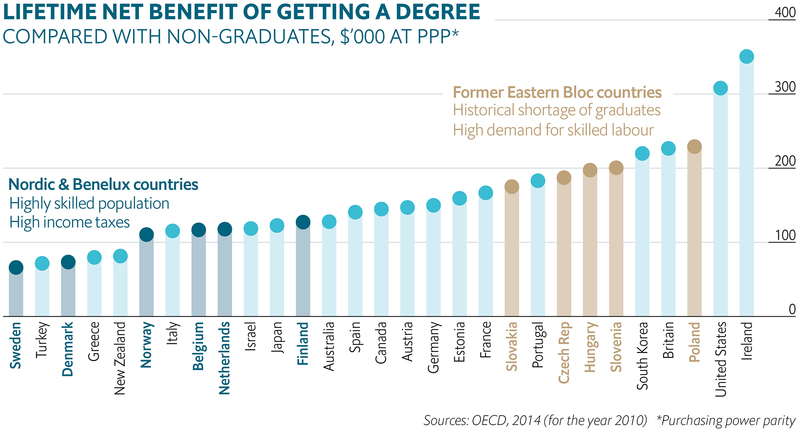 Much evidence around the world tells us that getting a degree leads to better job prospects and higher average earnings than those without a degree. A degree is the "ticket" to a higher standard of living. OK - there are many exceptions to this as there are plenty of rich people without a degree, and poor people with one. However, the consensus stongly favours the value of a degree. The report also tells us that unemployment "for under-35s has swelled to 8% for those with degrees – but to more than 20% for those without, and nearly 40% for secondary school drop-outs". That's quite a gap between the haves and the have-nots - this tells us that Ireland's "wealth now goes disproportionately to workers with letters after their names". But the biggest news is that Ireland ranks top of all OECD countries for "net benefit". Yes - we have a high cost of living, but the net benefit is clear. There is no breakdown by type of degree, I suspect that people with professional type degrees, eg law or medicine, plus those with IT qualifications, will do better again than those with Arts or Business degrees. So - if you are thinking about going to College straight after school, or coming back to education, the evidence strongly suggests that financially this would be a great move. Educationally it will also benefit most and you learn a lot when studying for a degree of any type. So check out courses starting in Ireland's Colleges this January or next September. You won't win the Lotto, but a degree is worth more to you here than anywhere else.